Tommy Rowe came off the bench to fire Doncaster Rovers to a hard earned and much-needed win over struggling AFC Wimbledon. The midfielder returned from two months out with a hamstring problem to drive home an 86th minute winner for Grant McCann’s men – ending a six-game sequence without a victory. It certainly wasn’t pretty to watch. But the win kept Rovers on the coattails of the top six and provided a confidence boost ahead of next week’s FA Cup replay with Chorley and trip to Barnsley. Rovers had fallen behind yet again when Mitchell Pinnock finished off a good Dons move just before the half hour. A wonder goal from Ali Crawford levelled matters before the break and a scrappy, uninspiring game appeared to heading for a draw – but Rowe had other ideas. Mallik Wilks limped off during an uneventful opening 20 minutes as neither side made any inroads. 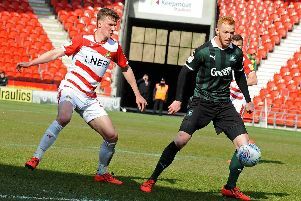 The visitors could sense some nerves in the Doncaster defence and went closest to breaking the deadlock when Kwesi Appiah played in Anthony Wordsworth but his heavy touch allowed to Ian Lawlor to mop up the loose ball. Appiah and Wordsworth were also involved in the slick move that led to the game’s opening goal on 26 minutes, finished off coolly by Pinnock, but the ease at which the Dons were able to play their way through was again a concern. Rovers had struggled to create anything meaningful but they levelled nine minutes before the break thanks to a superb piece of individual skill. Crawford collected a quick free kick and curled a sublime effort into the top corner from 25 yards. The second period saw Rovers enjoy the lion’s share of the play but they lacked incisiveness and invention in the final third. Danny Andrew drilled an effort wide and an off-colour John Marquis effort lacked conviction and was comfortable for Joe McDonnell. Rowe entered the fray as a 74th minute substitute and, with the game seemingly petering out, won it for Rovers when he picked up possession and lashed home left-footed from distance. Rovers: Lawlor, Mason, T Anderson, Butler, Andrew, Whiteman, Kane, Crawford (Rowe 74), Coppinger (Blair 70), Wilks (May 13), Marquis. Subs not used: Marosi, Cummings, J Anderson, Rowe, Beestin. AFC Wimbledon: McDonnell, Oshilaja, Nightingale, McDonald, Purrington, Wagstaff, Pinnock (Barcham 69), Trotter, Soares, Wordsworth (Jervis 80), Appiah (Pigott 72). Subs not used: King, Thomas, Hartigan, Sibbick.